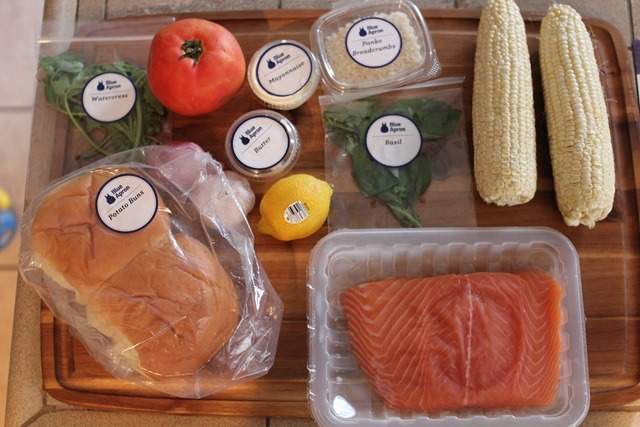 I am trying out the blue apron food delivery service. This was my first week and so far I am loving it. You can go on their website to find more info and pricing. I am guilty of throwing away produce at the end of the week that has gone bad. I feel horrible about it. I also avoid recipes that includes new ingredients that I have to buy and don’t have any use for the leftovers. Blue Apron solves that for me, the ingredients are delivered to your front door, everything you need to make several dishes, everything is used and there are no leftover food. It’s convenient and I feel like it’s a self-taught cooking class, with very good visuals to go along with it. My goal is to discover new recipes that I can add to our rotation and eventually can cook in batches. Yes, sometimes convenience means higher price. In this case, it is worth it for me. I feel more relax in the kitchen knowing I have everything I need and that everything laid out in front of me will be used and eaten. It is very satisfying. I am also learning new cooking methods and the reason why ingredients are cooked in certain way. 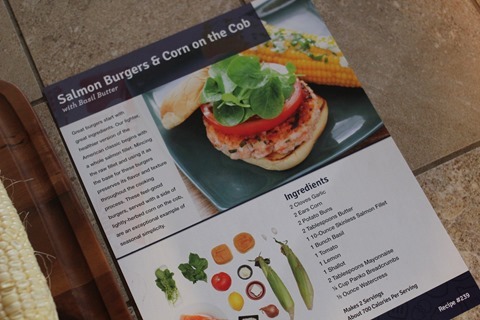 The first recipe I tried was the salmon burgers. During the first week of delivery, I ordered 3 meals, 2 servings each. I used a promotion code, so we got 2 free meals. Moving forward, I’ll plan on getting delivery every few weeks or so, I’m not interested on weekly delivery right now. I made everything according to instructions and using all the ingredients provided. 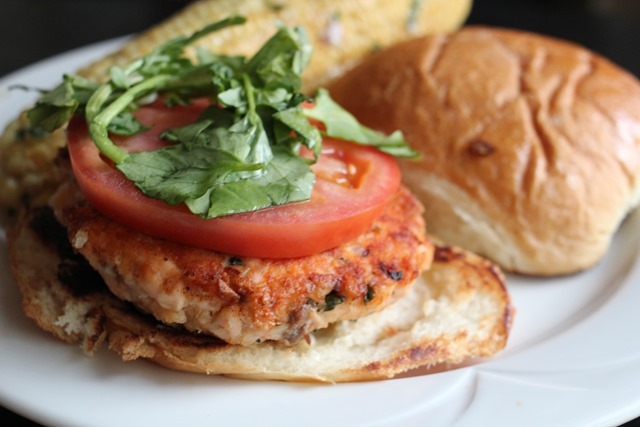 – I would add lettuce to the burgers, use whole wheat bread crumbs and whole wheat buns. I would double the aioli, because it was delicious and the hubby likes to have more sauce in his burgers. 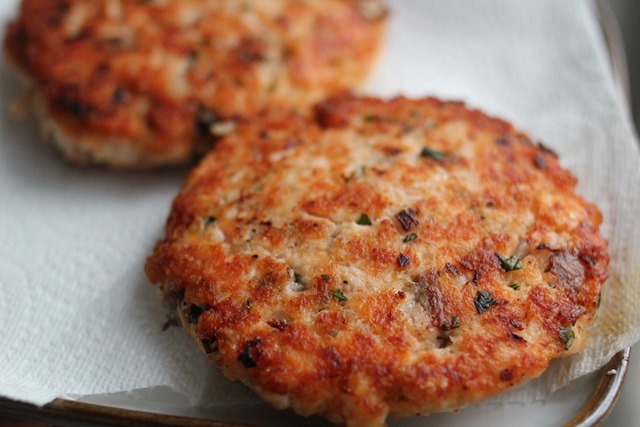 – Double/triple the salmon burger patties, and freeze for future meals. Wash and dry the fresh produce. Heat a large pot of salted water to boiling on high. Take the butter out of the refrigerator to soften. Peel and mince the garlic; then, using the flat side of your knife, smash until it resembles a paste. Remove and discard the husks and silks of the corn. (If the ears won’t fit into your pot, cut each in half.) Split the buns. Pick the basil leaves off the stems; discard the stems. Slice the tomato. Peel and mince the shallot to get 2 teaspoons of minced shallot. Quarter the lemon and remove the seeds. Finely chop the salmon. In a small bowl, combine the softened butter, half the basil (roughly chopping the leaves just before adding) and a pinch of shallot. Stir to incorporate and season with salt and pepper to taste. To make the aioli, in a separate small bowl, combine the mayonnaise, the juice of 1 lemon wedge, half the garlic paste and a splash of olive oil. Stir to combine and season with salt and pepper to taste. Set the basil butter and aioli aside as you continue cooking. In a medium bowl, combine the chopped salmon, panko breadcrumbs and the remaining garlic paste, shallot and basil (roughly chopping the leaves just before adding); season with salt and pepper. Gently mix to incorporate. 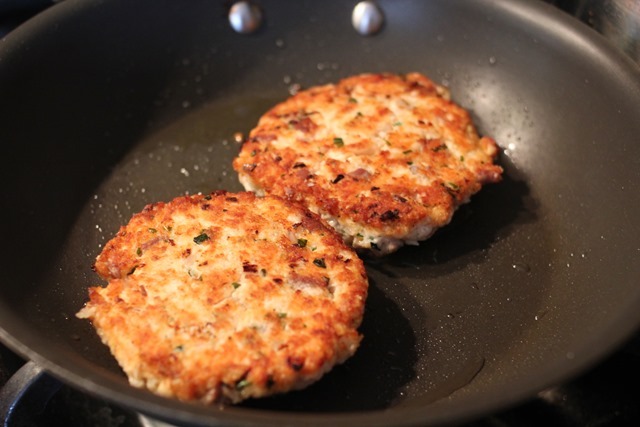 Form into 2 equal-sized patties. In a large pan (nonstick, if you have one), heat 2 teaspoons of olive oil on medium until hot. 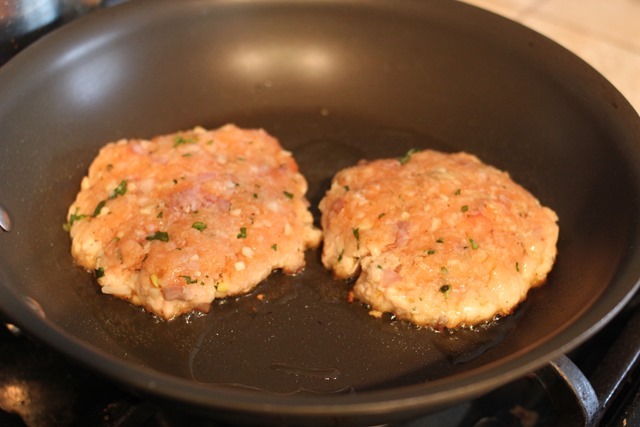 Add the salmon patties and cook 4 to 5 minutes per side, or until golden and cooked through. Transfer the cooked burgers to a paper towel-lined plate. Wipe out the pan. In the same pan used to cook the burgers, heat 2 teaspoons of olive oil on medium until hot. Add the potato buns, cut side down, and toast 1 to 2 minutes per side, or until lightly browned. Transfer the toasted buns to a clean work surface. 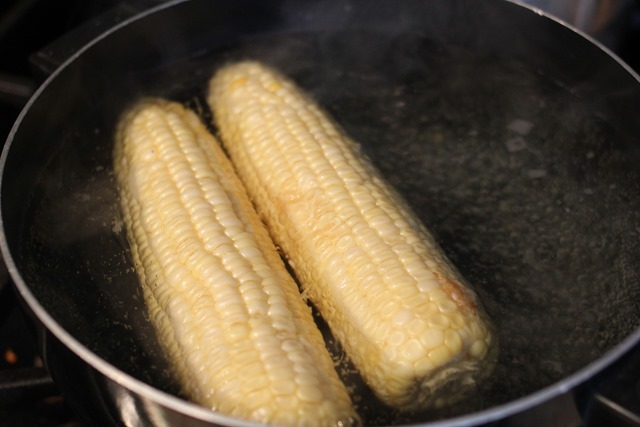 Carefully add the corn to the pot of boiling water. Cook 2 to 3 minutes, or until tender. Drain thoroughly and set aside in a warm place as you continue cooking. In a small bowl, toss the watercress with the juice of 1 lemon wedge and a drizzle of olive oil; season with salt and pepper to taste. Spread a thin layer of the aioli onto the insides of each bun. Place a burger and 1 to 2 tomato slices onto the bottoms of the buns; season the tomatoes with salt and pepper. Top the tomatoes with the dressed watercress and the tops of the buns. 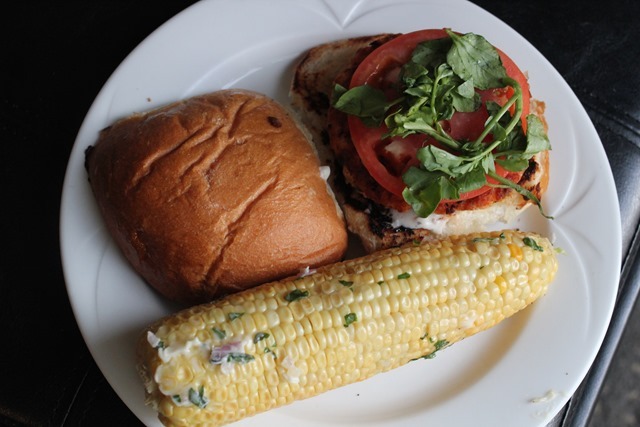 Spread the basil butter onto the cooked corn and serve on the side. Garnish with the remaining lemon wedges.